It is a life long passion for great epics that drove Robert Hossein to undertake a career as an actor in Films in the early 50’s often playing bad guys or passionate lovers. Robert Hosseinov was born in <?xml:namespace prefix = st1 ns = "urn:schemas-microsoft-com:office:smarttags" />Paris, to Iranian music composer Andre Aminollah Hossein (a converted Zoroastrian) and a Russian pianist mother. He was to work with such great French Stars as Jean Paul Belmondo, and Brigitte Bardot in films that since become classics. He truly gained fame in historical sequel films Angelique set in the 18th century France and with Co-Star the beautiful Michelle Mercier. However Hossein never was quite satisfied by his film career and turned to his initial passion theater, but as director, in the early seventies. He has gained the envied reputation of a kind of Cecile B. DeMille with successful adaptations of Shakespeare plays such as Julius Caesar or historical epic bio’s of Jesus Christ, General Charles De Gaulle or French revolutionary Danton. Hossein also visited Iran in the early seventies and participated to the Son et Lumiere in Persepolis. 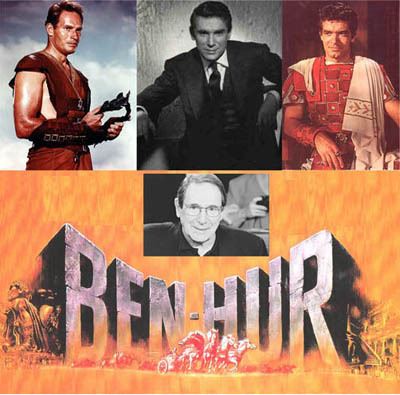 Hossein’s lifelong passion for Ben Hur was satisfied when he saw the Hollywood Epic in the late fifties and since them he has had an obsession to recreate this spectacle for a live audience and on stage. Now in his mid seventies the famous director has decided to meet this challenge and has announced that he will be producing a 13 million euros show in France’s largest Arena : The French Stadium that saw the victory of the French soccer team in the World Cup of ’98. Ben Hur’s foe Roman Centurion Messalla. Props from the original 1959 classic Epic film. 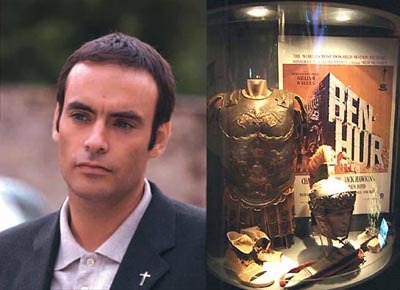 The success of epic sword and sandals in the past years in Movies such as Gladiator, or Troy have certainly motivated Hossein who expects 300,000 spectators in a show that will be repeated only four times in late September 2006. With a cast of 500 actors and extras the show will include the famous chariot race, the crucifixion of Christ as well as the spectacular naval battles between the Roman fleet and that of the Mediterranean pirates . As for the actors only the role of the evil Messala (the Roman childhood friend who sends Ben Hur to the galleys and banishes his family) has been announced : Anthony Delon son of famous Star Alain Delon. However the success of William Whyler’s MGM film adaptation with Charlton Heston and Stephan Boyed has entered film history for its famous chariot race shot in Cinemascope. Will Robert Hossein’s live version of this epic classic surpass our expectations? No one knows that answer for sure, but one can only admire Robert Hossein’s stamina and determination to fulfill a childhood dream and passion for an eternal tale of love and hate, revenge and pardon that are the essential ingredients to a successful epic story. About the Author: Darius KADIVAR is a freelance journalist born to an Iranian father and French mother. He works and lives in France.